Spinning (indoor cycling) – Indoor cycling classes are still one of the hottest trends in fitness. From the new exerciser, to the experienced student, to the elite cyclist, anyone can do it and everyone enjoys it. 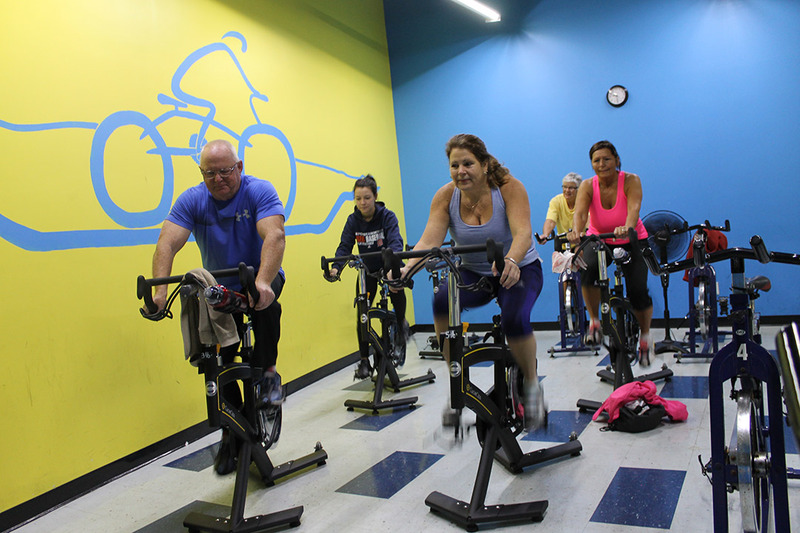 Classes are 45-60mins taught by certified cycling instructors. Follow the instructor’s commands carefully. Revolution and Ride for 30 minutes – a great way for a beginner to try out a spinning class without the pressure of a 45 – 60 minute class. OR – time crunched? Come in and get 30 minutes of great cardio – all are welcome. Spin & Abs – The all-encompassing journey trains the mind, breath, muscles, and joints to enhance equilibrium and agility. Spend 45 minutes on an intense and powerful bike ride to enliven the heart. Move to the mat for a 15 minute vibrant core work and cool down to balance out the body and calm the mind. The result is pure harmony. Note: Never pedal in a backwards motion while on the bike and it is very important to advise the instructor if you are new to Spinning (indoor cycling)! Improper adjustments or use of the bikes can result in injury and may damage the bike. Spinning Rules are posted outside and inside of the spinning room. DO YOU FEEL LIKE YOU’VE GOT WHAT IT TAKES?